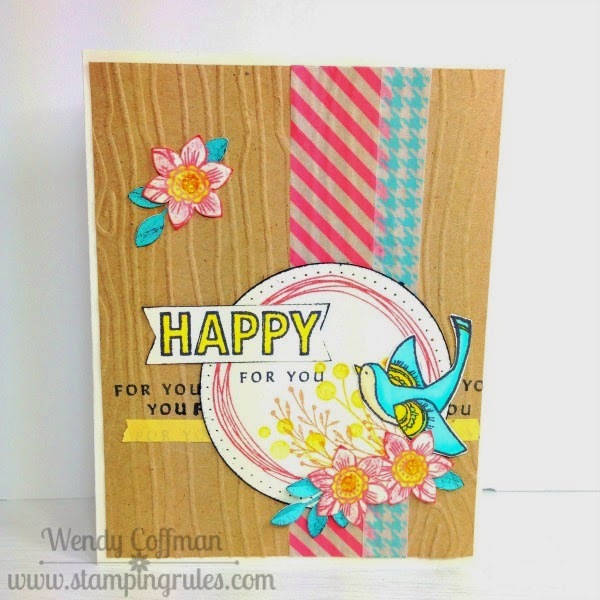 I've got a cheerful card for you today, using the cute new sketch from Mojo Monday! I've had this Happy Birds stamp set since Convention in July of last year, and I haven't inked it up since that first time I used it in class. This week I've made 4 cards with it. Guess the Mojo sketch got my mojo going! I sparked off the ColourQ color Challenge, using Smoothie, Lagoon, Honey, Kraft, and Colonial White. I cut some 6 pointed flowers from the Art Philosophy Cricut cartridge, but stamped them with the 5 petal flower in the stamp set. After inking the edges I decided I liked that effect quite a lot. 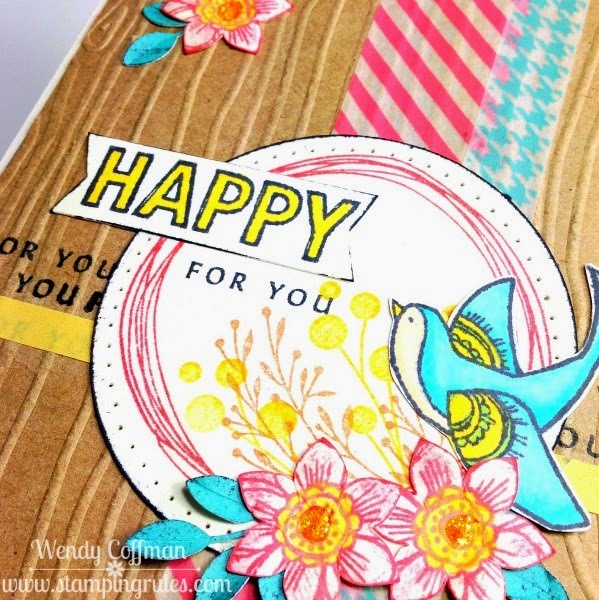 I added in some sentiment words from Happy To Be Friends, using them in the main sentiment and also in place of another strip of washi in the sketch design. The brush in the background came from Happy to Be Friends and Have a Happy Day which I just love so much. I added that circle from Doodled Designs too...I had quite the stack of stamps to put away when I was done with this one! I'm working on my first ever video on how I like to shape my leaves and flowers. We'll see how my iPhoneography lessons go this weekend...I did build a tripod using binder clips, washi tape, and rainbow loom rubber bands, so I'm feeling like a crafty MacGyver right now. With that attitude and a paperclip, everything is possible! Just fabulous! I love how you combined a little of this, and little of that, and a little more of something else. Such a beautiful card. I love your flowers. "Fussy cut by the Cricut" with all the fanciness and details of the stamp. It took me a bit to see exactly how you did that. Thanks for the explanation. Such a striking card! Love how that little birdie just pops.